Our minds are a tricky thing. And when it comes to coping with emotional situations, they don’t do us any favors. On a biological level, stress causes an increase in cortisol, a hormone that’s been linked to appetite. So, when you run to the freezer for that pint of ice cream after a tough day, your body may very well be telling you you’re hungry but are you really? And if you are, why the ice cream instead of a granola bar or yogurt? A 2017 study revealed that nearly 40% of Americans admit to stress-eating at least once a month. Half of those people admit to stress-eating every single week. And all of those junk foods? They’re mostly made of carbs and sugar which have been shown to trigger the pleasure sensors of your brain. You can’t help but feel good while eating them. Then there are the cultural impacts. Food is celebrated around the world. We eat on date nights. We eat during the holidays. We eat fast food in the car, slow food in the park, hot food around a campfire, and cold food at the beach. Social events, family memories, and tourist attractions focus on food. We celebrate with ice cream and pizza. How Do You Tell if You’re an Emotional Eater? True hunger comes with a few telltale signs such as a rumbling stomach, low energy, and slight irritability. If you’re not experiencing these symptoms, you’re probably not hungry. Paying attention to what and when you eat will tell you a lot about why you eat. Are you snacking because it’s mid-morning and your breakfast bagel has worn off? Or are you snacking because you had a stressful meeting at work? Maybe it’s hard to tell. Life is stressful, after all. Work, families, politics, finances, crime rates, there is no shortage of things in this world to get emotional about. So, if we’re all stressed all the time, how can we possibly tell the difference? It’s time to treat the problem, not hide it with food. 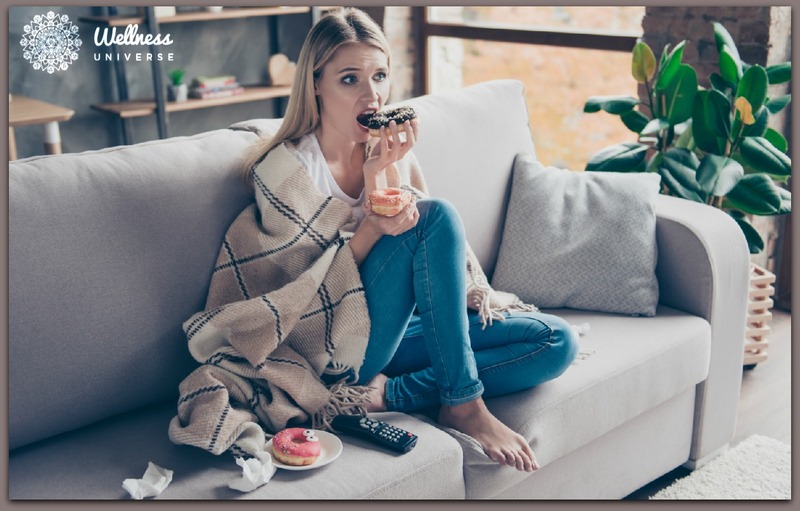 Emotional eating is a very real problem, but the root cause is not knowing how to deal with our strong emotions on an individual level. We live in a society where being angry, sad, lonely, bored, or frustrated is looked down upon. Acknowledge that your emotions are okay and take the time to deal with them as you need to. When you find yourself reaching for that bag of Doritos, ask yourself what you could do instead. Thirst is often mistaken for hunger; drinking water might be enough to get you over the craving. A few moments of quiet, mindful breathing may help the emotions pass. Taking a walk can do amazing things for your emotional state. If you find yourself snacking at your desk, keep nuts or granola bars within reach instead of chips and sweets. If you find yourself snacking before bed, keep the ice cream in the far back corner of the freezer so you have to dig to get to it. While you may still find yourself eating your feelings, at least you’re making healthy choices. And that’s a step in the right direction. Even better, analyze your overall health choices. Are you getting enough sleep? Are you exercising? Are your relationships positive? Looking to first improve these aspects of your life may eliminate your emotional eating completely. Previous articleWhen You Look in the Mirror, What Do You See?